This patient came in with the buccal cusp fractured off on his upper right first bicuspid. Using the advanced CEREC technology, a full coverage CEREC restoration was designed on the computer screen. 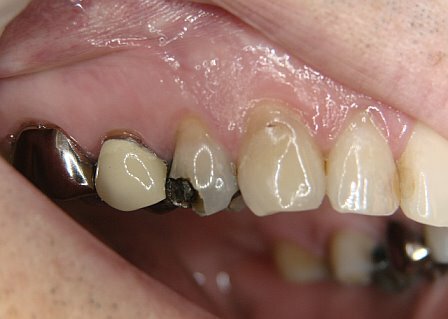 A block of porcelain that matches the shade of his adjacent teeth were selected and was “loaded” onto the milling machine. In about 10 minutes the CEREC crown was milled out. 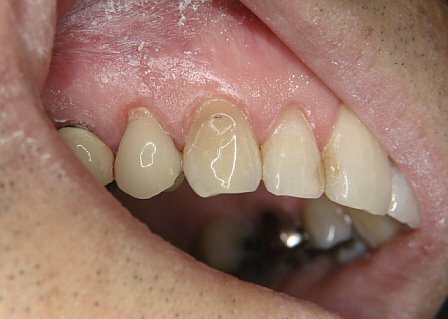 Post-op photo: Metal-free ceramic crowns were cemented. Observe the excellent esthetics. The whole procedure took a little over one hour, patient got the crown done the same day, no temporaries, no second appt necessary, thanks to CEREC technology.